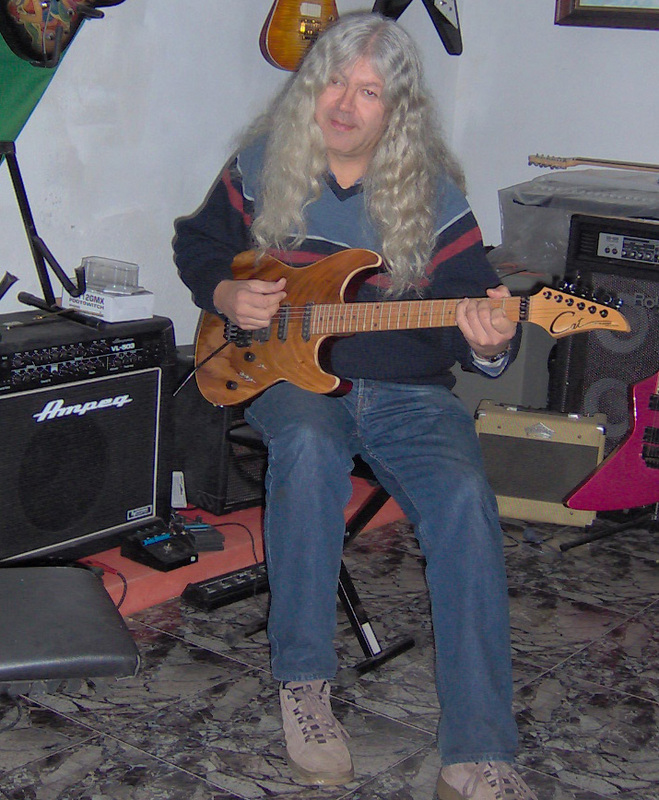 My name is Carlos Tavares and I am a professional Luthier and amp tech. Also I am a guitar collector because I love guitars and amps and a few years ago when I played on local bands I decided that all the money that I can win playing on the guitar will go to buy more guitars for my collection. Now I dont play anymore on local bands because they ended,but still play whenever I have opportunity to play . I am not a very good player I think because I never took the time necessary to learn completely the instrument I prefer to spend more time making them than playing them. I started my career many years ago at the age of 17 making hi-fi audio amps for myself and for some friends,and soon the people around me discovered that I know about electronics and start asking me to repair radios ,tvs and all sort of electro domestic devices. I did not like to repair that kind of stuff,but it is a way to earn some money and I did until I can find something that I like more and I can live from . That eventually came one day some years late when I friend of me that owned a local band,asked me if I can repair one amp from his band that is burned during a show. I repaired the amp and he spread the news that I was a good technician ,after that another local bands started to bring me they-er stuff that needed to be repaired or modified. At the time I did not play any kind of instrument but the Guitar fascinated me when I went to see the practising sessions of some of local bands, so I decided that I will learn to play the guitar because I loved the sounds the guitar make and all the sounds that those little boxes (pedals) they used all that fascinated me more that any other instrument. Noticing my interest on the guitar, one of the guitarists from a local band offered to teach me the basic chords and scale positions and soon I learned to play the guitar and started to play on some of these local bands as amateur during the weekends. during the week I continued to work as amp repairman and slowly abandoning the repair of tvs and hi-fi. When I started to play on the local bands as amateur all the money that I earn with the shows I saved it to buy a new guitar and soon others follow,that’s how my collection started.At the time I did not know or have any idea how a guitar is made I only understand the electronics of the guitar because I am very curious and didn t resist until I open my guitar to see what is inside of it , and start making some modifications. That curiosity led me want to know how a guitar is build and make my own guitar,so I immigrated to the USA and frequented some workshops about guitar making, soon I started to make guitar repairs and guitars for my costumers. I made during all this years many guitars and basses from all kind of shapes for local guitar players and for some costumers that I have abroad,but all these guitars are personalized according to the taste of the owners,of course with my advice concerning the choice of woods,pus and hardware,these guitars are one of a kind,because they are very personalized and the only exemplar. Now after 25 years building these guitars and repairing hundreds I think is time to start making my own models ,the guitars that I believe are the best guitars one can make with the best woods ,hardware and knowledge of 25 years of experience as Luthier. Also I want to experiment making guitars with new kinds of woods because there is a lot of species and only a few are used until today,because traditionalism in guitar making.I want to break with that and show that are many other good wood species that can be used for guitar making,and some of then are even better then the traditional ones used until today.Watch my Current jobs page in the future to see some news about this. For ending this long biography I need to say that I like to do all kind of mechanical things and inventing new tools and machines,so for this reason many of the machines and jigs that I use on my workshop are invented or made by myself ,the last one was a small CNC machine for doing inlays and engraving and soon a bigger one will be ready for cutting bodies and necks. I finalize this about me biography saying thank you to all that came to my blog and have the time and patience to know about me and my work. Also I would like that you can forgive me if my English text will have some mistakes but my main language is Portuguese,so please forgive me if I write some word that is not correct.